With Adobe Illustrator, you can produce artwork that can be published with ease on Web pages, PDAs, wireless devices, and in print. It is industry-standard vector graphics software. A variety of tools and palettes for editing and adding elements such as masks and layers. The first time you start Illustrator, the Tools panel appears on the left side of the screen. The tools in the toolbox let you create, select, and manipulate objects in Illustrator. 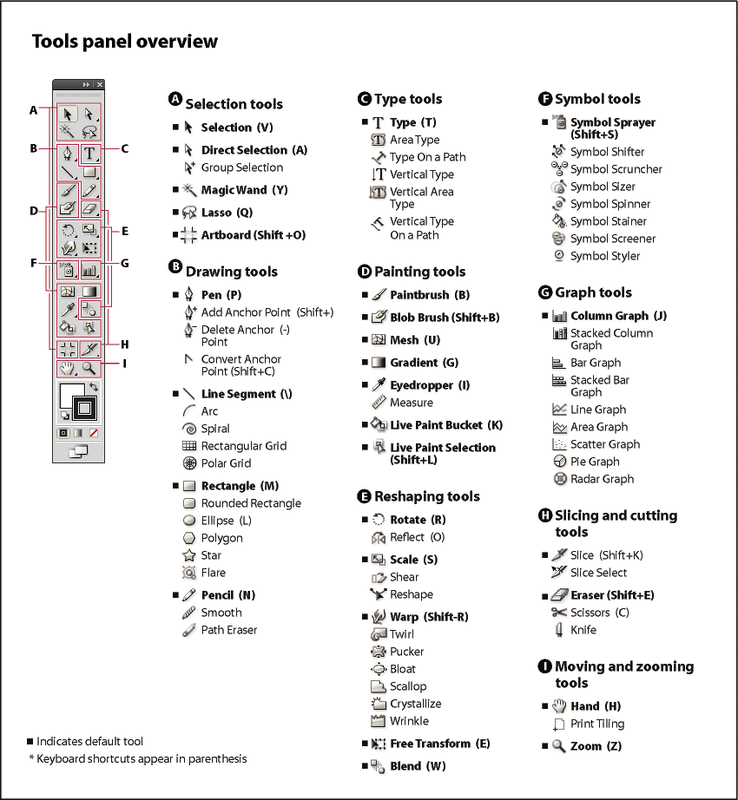 Click the Tools Panel overview at the left to enlarge it. Image courtesy of Adobe. The Pen Tool (Shortcut: P) is definitely the most important tool to know how to use in Illustrator. Mastering this tool will give you a firm grasp on drawing custom objects, which is a skill that will serve you well as long as you use this program. The Pen Tool draws curved and straight lines in order to create objects. In order to create straight lines, simply select the Pen Tool, click once to create a start point, then click again anywhere else on the image. In order to create points in 45 degree increments, simply hold the shift key and then click somewhere else on the screen. In order to draw curves, click hold and drag in the direction you want the curve to go in using the Pen Tool, as shown in the first part of the image above. Next, click hold and drag at another position (the end of the curve) and drag it in the opposite direction in order to complete the curve. Next, you can either: draw the next segment of a continuous curve by positioning the pointer where you want the next segment to end, and then drag away from the curve OR you can change the direction of the curve in order to create a noncontinuous curve by releasing the mouse button, pressing the Option/Alt key, dragging the direction point in the direction of the curve, Releasing the Option/Alt key and the mouse button, reposition the pointer, and drag in the opposite direction to complete the curve segment. See the image below in order to create a noncontinuous curve. To edit a curve choose the direct selection tool. When you first select a curve all the anchor points will be selected. You know a point is selected if it is dark. If it is not selected it is hollow. Click on a anchor point to select it. Then click and drag to move it. If the anchor point is smooth you can click the shape points and change the shape. To move multiple points drag a box around them, or hold shift and click them to select more than one at once. There are several tutorials on the web for creating the "Aqua" button using Adobe Photoshop. Creating the same style of button using Adobe Illustrator 10 is just as easy, and perhaps even easier. Below is a picture of the "aqua" button. Step 1: Start by selecting the rounded rectangle tool. Step 2: Next, double click once on the artboard to bring up the rounded rectangle dialog box. Enter the settings shown at right. Be sure to type in "px" at the end of each number to designate "pixels". Step 3: Bring up the GRADIENT (F9) palette. Use a linear gradient with an angle of 90 degrees. Drag and drop the swatch onto the button. Step 4: Using the WEB palette, located in WINDOW/SWATCH LIBRARIES, drag and drop the desired dark color to the right gradient slider. Step 5: Double click on the SCALE (S) tool in the toolbox to bring up the SCALE dialog box. Set the uniform scale to 80% and click the COPY button. Step 6: Use the SCISSORS tool to cut the left and right anchor points of the duplicated button. Using the SELECT (V) tool, choose the bottom part of the scaled down button and delete it. Step 7: Use the PEN (P) tool and connect the lower right and lower left anchor points of the halved button. Step 8: Set the halved button to default colors of white fill and black stroke by either pressing "D" or the DEFAULT colors button. Step 10: Under EFFECTS / SVG FILTERS use the AI_GAUSSIAN BLUR4 effect to soften the highlight. The second part of this lab we will go into creating 3D Text effects. Again, there are a number of online tutorials and if you're interested, you should check them out! Step 1: Start with some text. Use a heavy font like Arial Bold. Step 2: Change the text to outlines. Select the text using selection tool and go TYPE - CREATE OUTLINES (CTRL + SHIFT + O). Step 3: Next, enlarge the text to the desired size by using the FREE TRANSFORM tool (E)in the toolbox. Step 4: With the object selected, press CTRL + C to copy it to the clipboard for later retrieval. Step 5: Set the background object to a light gray. Step 6: Duplicate the object by selecting it with the SELECT tool (V), holding down the ALT key and dragging the object. Offset the two objects the desired amount, but not too far. Step 7: Set the foreground object to dark gray. Step 8: Double click on the BLEND tool in the toolbox and set the specified steps desired. Object offset is important here. The farther apart the objects are, the more steps are needed to get a smooth blend. Step 9: Use the BLEND tool to select one of the anchor points on the front object. Step 10: Move the BLEND tool over an anchor point on the background object (you will see a "+" show up on the cursor). Click the mouse. Blending can take time, depending on the number of steps entered in step 8. Be patient! Step 11: Press CTRL + V to paste the earlier copied object back to the artboard. Align it over the top of the foreground object and you're finished! Play with the settings, distances, and colors to achieve the desired effects. For this lab assignment I want you to design a concert or promotional poster for your favourite musical artist or event. 1: Technical - use of diverse/difficult techniques. 1: Art - creativity, skill, and originality etc. Use DropBox to submit your Illustrator project file and all supporting files before the beginning of your lab section next week. If DropBox is not working for you, let me know and we'll work something out.